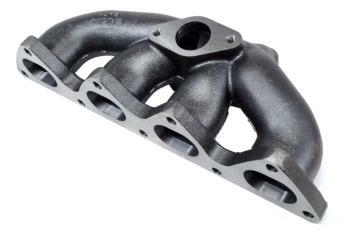 BLOX Racing Turbo Exhaust Manifolds are cast using high silicone ductile iron. Using the latest casting technologies, BLOX Racing makes each exhaust runner only 3.5mm thick, dramatically reducing each unit’s overall weight. In addition, each exhaust manifold is designed with a centralized wastegate bung, located between the #2 and #3 cylinders, to improve boost response. All BLOX Racing Turbo Exhaust Manifolds come with a lifetime warranty against cracks, making them superior over the competitors. 38mm wastegate neck adapters and dump tubes are also available.